In general, the law of the European Union is valid in all of the twenty-eight European Union member states. However, occasionally member states negotiate certain opt-outs from legislation or treaties of the European Union, meaning they do not have to participate in certain policy areas. Currently, four states have such opt-outs: United Kingdom (four opt-outs), Denmark (three opt-outs), Republic of Ireland (two opt-outs) and Poland (one opt-out). This is distinct from the enhanced cooperation, a measure introduced in the Treaty of Amsterdam, whereby a minimum of nine member states are allowed to co-operate within the structure of the European Union without involving other member states, after the European Commission and a qualified majority have approved the measure. It is further distinct from Mechanism for Cooperation and Verification and permanent acquis suspensions, whose lifting is conditional on meeting certain benchmarks by the affected member states. As of 2015, four states have formal opt-outs from a total of five policy areas. 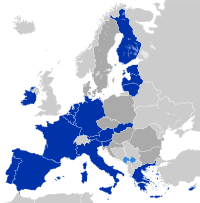 The Schengen Agreement abolished border controls between member states. Ireland and the United Kingdom received opt-outs from implementing the Schengen acquis when the Treaty of Amsterdam of 1997 incorporated it into the EU treaties, as they were the only EU member states which had not signed the agreement. However, the protocol on the Schengen acquis specified that they could request to opt into participating in Schengen measures on a case-by-case basis if they wished, subject to unanimous approval of the other participating states. Ireland only joined the UK in adopting this opt-out to keep their border with Northern Ireland open via the Common Travel Area (CTA). Prior to the renewal of the CTA in 2011, when the British government was proposing that passports be required for Irish citizens to enter the UK, there were calls for Ireland to join the Schengen Area. However, in response to a question on the issue, Bertie Ahern, the then-incumbent Taoiseach, stated: "On the question of whether this is the end of the common travel area and should we join Schengen, the answer is 'no'." The opt-out has been criticised in the United Kingdom for hampering the United Kingdom's capabilities in stopping transnational crime through the inability to access the Schengen Information System. The UK formally requested to participate in certain provisions of the Schengen acquis – Title III relating to Police Security and Judicial Cooperation – in 1999, and this was approved by the Council of the European Union on 29 May 2000. The United Kingdom's formal participation in the previously approved areas of cooperation was put into effect by a 2004 Council decision that came into effect on 1 January 2005. In contrast, while Ireland initially submitted a request to participate in the Schengen acquis in 2002, which was approved by the Council of the European Union, that decision has not yet been put into effect. In February 2010 the Irish Minister for Justice, in response to a parliamentary question, said that: "[t]he measures which will enable Ireland to meet its Schengen requirements are currently being progressed". The protocol on the Schengen acquis and protocol on Denmark of the Treaty of Amsterdam stipulate that Denmark, which had signed an accession protocol the Schengen Agreement, would continue to be bound by the provisions and would have the option to participate in future developments of the Schengen acquis, but would do so on an intergovernmental basis rather than under EU law for the provisions which fell under the Justice and Home Affairs pillar, from which Denmark obtained an opt-out. However, the protocol stipulates that if Denmark chooses not to implement future developments of the Schengen acquis, the EU and its member states "will consider appropriate measures to be taken". In the negotiations for the Lisbon Treaty, Denmark obtained an option to convert its Area of freedom, security and justice (which had incorporated the former Justice and Home Affairs pillar) opt-out into a flexible opt-in modelled on the Irish and British opt-outs. The Protocol stipulates that if Denmark exercises this option, then it will be bound by the Schengen acquis under EU law rather than on an intergovernmental basis. In a referendum on 3 December 2015, 53.1% rejected exercising this option. 2 using the euro unilaterally (Kosovo[a] and Montenegro). All member states, other than Denmark and the United Kingdom, have either adopted the euro or are legally bound to do so. During the negotiations of the Maastricht Treaty of 1992 the UK secured an opt-out, while a protocol gave Denmark the right to decide if and when they would join the euro. Denmark subsequently notified the Council of the European Communities of their decision to opt out of the euro, and this was included as part of the 1992 Edinburgh Agreement, a Decision of Council, reached following the Maastricht Treaty's initial rejection in a 1992 Danish referendum. The purpose of the agreement was to assist in its approval in a second referendum, which it did. In the UK, the Labour government of Tony Blair argued that the UK should join the euro, contingent on approval in a referendum, if five economic tests were met. However, the assessment of those tests in June 2003 concluded that not all were met. The policy of the 2010s coalition government, elected in 2010, was against introducing the euro prior to the 2015 general election. In 2000 the Danish electorate voted against joining the euro in a referendum by a margin of 53.2% to 46.8% on a turnout of 87.6%. 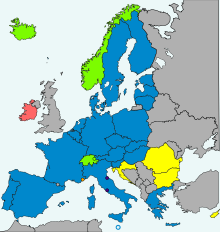 While the remaining states are all obliged to adopt the euro eventually by the terms of their accession treaties, since membership in the Exchange Rate Mechanism is a prerequisite for euro adoption, and joining ERM is voluntary, these states can ultimately control the timing of their adoption of the euro by deliberately not satisfying the ERM requirement. The Edinburgh Agreement of 1992 included a guarantee to Denmark that they would not be obliged to join the Western European Union, which was responsible for defence. Additionally, the agreement stipulated that Denmark would not take part in discussions or be bound by decisions of the EU with defence implications. The Treaty of Amsterdam of 1997 included a protocol which formalised this opt-out from the EU's Common Security and Defence Policy (CSDP). As a consequence, Denmark is excluded from foreign policy discussions with defence implications and does not participate in foreign missions with a defence component. Although not a full opt-out, both Poland and the United Kingdom secured clarifications about how the Charter of Fundamental Rights of the European Union, a part of the Treaty of Lisbon, would interact with national law in their countries limiting the extent that European courts would be able to rule on issues related to the Charter if they are brought to courts in Poland or the UK. Poland's then ruling party, Law and Justice, mainly noted concerns that it might force Poland to grant homosexual couples the same kind of benefits which heterosexual couples enjoy, while the UK was worried that the Charter might be used to alter British labour law, especially as relates to allowing more strikes. The European Scrutiny Committee of the British House of Commons, including members of both the Labour Party and the Conservative Party, has however cast doubts on the provision's text, asserting that the clarification might not be worded strongly and clearly enough to achieve the government's aims. After the Civic Platform won the 2007 parliamentary election in Poland, it announced that it would not opt-out from the Charter, leaving the UK as the only state not to adopt it. However, Donald Tusk, the new Prime Minister and leader of the Civic Platform, later qualified that pledge, stating he would consider the risks before signing the Charter, and on 23 November 2007 he announced that he would not sign the Charter after all (despite the fact that both his party and their coalition partner, the Polish People's Party, were in favour of signing), stating that he wanted to honour the deals negotiated by the previous government and that he needed the support of Law and Justice to gain the two-thirds majority necessary to ratify the Treaty of Lisbon in the Parliament of Poland. Shortly after the signature of the treaty, the Polish Sejm passed a resolution which expressed its desire to be able to withdraw from the Protocol. Tusk later clarified that he may sign up to the Charter after successful ratification of the Treaty of Lisbon has taken place. However, after the treaty entered into force a spokesperson for the Polish President argued that the Charter already applied in Poland and thus it was not necessary to withdraw from the protocol. He also stated that the government was not actively attempting to withdraw from the protocol. Polish Minister of Foreign Affairs Radosław Sikorski, of Civic Platform, argued that the protocol only narrowly modified the charter's application in Poland, and that formally renouncing the opt-out would require a treaty amendment which would need to be ratified by all EU member states. In April 2012, Leszek Miller, leader of the Democratic Left Alliance, stated that he would sign the charter if he comes to power. According to Andrew Duff, British Member of the European Parliament, "A Polish constitutional mechanism has since been devised whereby Poland can decide to amend or to withdraw from the Protocol, and such a possibility remains under review." In 2009, Czech President Václav Klaus refused to complete ratification of the Treaty of Lisbon unless the Czech Republic was given an opt-out from the Charter of Fundamental Rights (as Poland and the United Kingdom had been with Protocol 30(source)) fearing the Charter would allow the families of Germans who were expelled from territory in the modern-day Czech Republic after the Second World War to challenge the expulsion before the EU's courts, though legal experts have suggested that the laws under which the Germans were expelled, the Beneš decrees, did not fall under the jurisdiction of EU law. In October 2009, EU leaders agreed to amend the protocol to include the Czech Republic at the time of the next accession treaty. In September 2011, the Czech government formally submitted a request to the Council that the promised treaty revisions be made to extend the protocol to the Czech Republic, and a draft amendment to this effect was proposed by the European Council. However, the Czech Senate passed a resolution in October 2011 opposing their accession to the protocol. When Croatia's Treaty of Accession 2011 was signed in late 2011, the Czech protocol amendment was not included. In October 2012, the European Parliament Constitutional Affairs Committee approved a report which recommended against the Czech Republic's accession to the Protocol. On 11 December 2012, a third draft of the European Parliament's committee report was published, and on 22 May 2013 the Parliament voted in favour of calling on the European Council "not to examine the proposed amendment of the Treaties". The Parliament did, however, give its consent in advance that a treaty revision to add the Czech Republic to Protocol 30 would not require a new convention. In January 2014, the new Czech Human Rights Minister Jiří Dienstbier Jr. said that he would attempt to have his country's request for an opt-out withdrawn. This was confirmed on 20 February 2014 by the new Prime Minister Bohuslav Sobotka, who withdrew the request for an opt-out during a meeting with President of the European Commission José Manuel Barroso shortly after his newly elected government won the confidence of Parliament. In May 2014, the Council of the European Union formally withdrew their recommendation to hold a Intergovernmental Conference of member states to consider the proposed amendments to the treaties. Denmark, Ireland and the United Kingdom have opt-outs from the area of freedom, security and justice. Ireland and the United Kingdom have a flexible opt-out from legislation adopted in the area of freedom, security and justice, which includes all matters previously part of the pre-Amsterdam Justice and Home Affairs (JHA) pillar. This allows them to opt-in or out of legislation and legislative initiatives on a case-by-case basis, which they usually do, except on matters related to Schengen. The opt-out from the JHA policy area was originally obtained by both states in the Treaty of Amsterdam of 1997, and was retained with the Treaty of Lisbon. Under Protocol 36 of the Lisbon Treaty, the UK had the option to opt out of all the police and criminal justice legislation adopted prior to the treaty's entry into force which had not been subsequently amended. The decision to opt out had to be made at least six months prior to the aforementioned measures coming under the jurisdiction of the European Court of Justice on 1 December 2014. The UK informed the European Council of their decision to exercise their opt-out in July 2013, and as such the impacted legislation ceased to apply to the UK as of 1 December 2014. While the protocol only permitted the UK to either opt-out from all the legislation or none of it, they subsequently opted back into some measures. In contrast, Denmark has a more rigid opt-out from the area of freedom, security and justice. While the Edinburgh Agreement of 1992 stipulated that "Denmark will participate fully in cooperation on Justice and Home Affairs", the Treaty of Amsterdam of 1997 included a protocol which exempt it, as a matter of EU law, from participating in these policy areas, which are instead conducted on an intergovernmental basis with Denmark. The exception is the Schengen visa rules. When a measure is adopted which builds upon the Schengen acquis, Denmark has six months to decide whether to implement it. If Denmark decides to implement the measure, it takes the force of an international agreement between Denmark and the Schengen states. A failure by Denmark to implement a Schengen measure could result in it being excluded from the Schengen Area. A number of other parallel intergovernmental agreements have been concluded between the EU and Denmark to extend to it EU Regulations adopted under the area of freedom, security and justice, which Denmark can't participate in directly due to its opt-out. These include the Brussels Convention and Dublin Convention. In the negotiations of the Lisbon Treaty, Denmark obtained an option to convert its opt-out into a flexible opt-in modelled on the Irish and British opt-outs. In a referendum on 3 December 2015, 53.1% rejected exercising of this option. Several times an EU member state has faced domestic public opposition to the ratification of an EU treaty leading to its rejection in a referendum. To help address the concerns raised, the EU has offered to make a "legal guarantee" to the rejecting state. These guarantees did not purport to exempt the state from any treaty provisions, as an opt-out does. Instead they offered a clarification or interpretation of the provisions to allay fears of alternative interpretations. The provisions of Part Two of the Treaty establishing the European Community relating to citizenship of the Union give nationals of the Member States additional rights and protection as specified in that Part. They do not in any way take the place of national citizenship. The question whether an individual possesses the nationality of a Member State will be settled solely by reference to the national law of the Member State concerned. Citizenship of the Union shall complement and not replace national citizenship. Following the rejection of the Treaty of Lisbon by the Irish electorate in 2008, a number of guarantees (on security and defence, ethical issues and taxation) were given to the Irish in return for holding a second referendum. On the second attempt in 2009 the treaty was approved. Rather than repeat the ratification procedure, the guarantees were merely declarations with a promise to append them to the next treaty. The member states ultimately decided not to sign the protocol alongside the Croatian accession treaty, but rather as a single document. A draft protocol to this effect was proposed by the European Council and adopted by the European Parliament in April 2012. An Intergovernmental Conference followed on 16 May, and the protocol was signed by all states of the European Union between that date and 13 June 2012. The protocol was planned to take effect from 1 July 2013, provided that all member states had ratified the agreement by then, but it only entered into force on 1 December 2014. The Major ministry negotiated a United Kingdom opt-out from the Social Chapter of the Maastricht Treaty before it was signed in 1992. The Blair ministry abolished this opt-out immediately after coming to power in the 1997 general election. Following the announcement by the government of the United Kingdom that it would hold a referendum on withdrawing from the European Union, an agreement was reached between it and the EU on renegotiated membership terms should the state vote to remain a member. In addition to a number of amendments to EU Regulations which would apply to all states, a legal guarantee would be granted to the UK that would explicitly exempt it from the treaty-stated symbolic goal of creating an "ever closer union" by deepening integration. This guarantee was included in a Decision by the European Council, with the promise that it would be incorporated into the treaties during their next revision. However, following the referendum, in which the UK voted to leave the EU, per the terms of the Decision the provisions lapsed. "opt-in" – possibility to opt in on a case-by-case basis. ^ a b Parliament of the United Kingdom (12 March 1998). "Volume: 587, Part: 120 (12 Mar 1998: Column 391, Baroness Williams of Crosby)". House of Lords Hansard. Retrieved 13 October 2007. ^ Publications Office (10 November 1997). "Article 2". Protocol on the application of certain aspects of Article 7a of the Treaty establishing the European Community to the United Kingdom and to Ireland, attached to the Treaty of Amsterdam. Retrieved 24 October 2007. ^ a b c "Expanding Schengen outside the Union". 10 January 2008. Retrieved 27 February 2014. ^ Collins, Stephen (24 October 2007). "Irish will need passports to visit Britain from 2009". The Irish Times. Retrieved 24 October 2007. ^ Dáil Éireann (24 October 2007). "Vol. 640 No. 2". Dáil Debate. Retrieved 25 October 2007. ^ Parliament of the United Kingdom (2 March 2007). "9th Report of 2006/07, HL Paper 49". Schengen Information System II (SIS II), House of Lords European Union Committee (Sub-Committee F). Archived from the original on 9 November 2007. Retrieved 24 October 2007. ^ >Minister for Justice, Equality and Law Reform, Dermot Ahern, Dáil Debates volume 698 number 1: Priority Questions—International Agreements (10 December 2009). ^ a b "Denmark to vote on Justice and Home Affairs opt-in model on 3 December". Ministry of Foreign Affairs of Denmark. 21 August 2015. Retrieved 21 August 2015. ^ Staff writer (11 December 2003). "Euro poll question revealed". BBC News. Retrieved 17 October 2007. ^ "BBC News - David Cameron and Nick Clegg pledge 'united' coalition". bbc.co.uk. ^ "EU - The Danish Defence Opt-Out". Danish Ministry of Defence. Retrieved 12 April 2014. ^ European Parliament (10 October 2007). "MEP debate forthcoming crucial Lisbon summit and new Treaty of Lisbon". Press Service. Retrieved 13 October 2007. ^ Staff writer (5 October 2007). "Finland's Thors blasts Poland over EU rights charter". NewsRoom Finland. Retrieved 13 October 2007. ^ Williams, Liza (9 October 2007). "Should a referendum be held on EU treaty?". Liverpool Daily Post. Archived from the original on 20 October 2007. Retrieved 13 October 2007. ^ Branigan, Tania (10 October 2007). "MPs point to flaws in Brown's 'red line' EU treaty safeguards". The Guardian. UK. Retrieved 13 October 2007. ^ Wintour, Patrick (12 October 2007). "Opt-outs may cause problems, MPs warn Brown". The Guardian. UK. Retrieved 13 October 2007. ^ European Scrutiny Committee (2 October 2007). "European Union Intergovernmental Conference". European Scrutiny – Thirty-Fifth Report. British House of Commons. Retrieved 14 October 2007. ^ Staff writer (22 October 2007). "Poland's new government will adopt EU rights charter: official". EUbusiness. Archived from the original on 17 December 2007. Retrieved 22 October 2007. ^ Staff writer (25 October 2007). "Poland will ponder before signing EU rights deal". EUbusiness. Archived from the original on 5 February 2008. Retrieved 25 October 2007. ^ Staff writer (23 November 2007). "No EU rights charter for Poland". BBC News. Retrieved 23 November 2007. ^ "UCHWAŁA - Sejmu Rzeczypospolitej Polskiej z dnia 20 grudnia 2007 r. w sprawie traktatu reformującego UE podpisanego w Lizbonie 13 grudnia 2007 r." Sejm. 20 December 2007. Retrieved 9 February 2014. ^ Staff writer (4 December 2007). "Russia poll vexes EU and Poland". BBC News. Retrieved 4 December 2007. ^ "Karta Praw Podstawowych nie musi być ratyfikowana. 'Bo obowiązuje'" (in Polish). 14 September 2011. Retrieved 9 February 2013. ^ "Siwiec pyta Sikorskiego o Kartę Praw Podstawowych" (in Polish). 9 September 2011. Retrieved 9 February 2013. ^ "Kongres SLD. Wybór nowych władz partii" (in Polish). 28 April 2012. Retrieved 9 February 2013. ^ "WRITTEN EVIDENCE FROM ANDREW DUFF MEP". 6 January 2014. Retrieved 9 February 2014. ^ David Charter (13 October 2009). "I will not sign Lisbon Treaty, says Czech President". The Times. London. Retrieved 28 January 2010. ^ Vaughne Miller (9 November 2009). "The Lisbon Treaty: ratification by the Czech Republic" (PDF). The House of Commons Library. p. 10. Archived from the original (PDF) on 9 November 2010. Retrieved 28 January 2010. Steve Peers (12 October 2009). "The Beneš Decrees and the EU Charter of Fundamental Rights" (PDF). Statewatch. p. 9. Retrieved 28 January 2009. ^ Andrew Gardner (29 October 2009). "Klaus gets opt-out". European Voice. Retrieved 28 January 2010. ^ a b "European Parliament resolution of 22 May 2013 on the draft protocol on the application of the Charter of Fundamental Rights of the European Union to the Czech Republic (Article 48(3) of the Treaty on European Union) (00091/2011 – C7-0385/2011 – 2011/0817(NLE))". 22 May 2013. ^ a b c "Application of the Charter of Fundamental Rights of the European Union to the Czech Republic. Protocol (amend.)". European Parliament. Archived from the original on 10 May 2013. Retrieved 3 March 2012. ^ "SECOND DRAFT REPORT on the draft protocol on the application of the Charter of Fundamental Rights of the European Union to the Czech Republic (Article 48(3) of the Treaty on European Union)". European Parliament Committee on Constitutional Affairs. 4 April 2012. Retrieved 7 July 2012. ^ "Duff welcomes vote against Czech attack on Charter". Alliance of Liberals and Democrats for Europe. 9 October 2012. Archived from the original on 3 January 2013. Retrieved 31 January 2013. ^ "Third draft report – on the draft protocol on the application of the Charter of Fundamental Rights of the European Union to the Czech Republic (2011/0817 NLE)" (PDF). European Parliament. 11 December 2012. Retrieved 19 December 2012. ^ "Press Release". alde.eu. 27 January 2014. ^ "European Parliament decision of 22 May 2013 on the European Council's proposal not to convene a Convention for the addition of a Protocol on the application of the Charter of Fundamental Rights of the European Union to the Czech Republic, to the Treaty on European Union and the Treaty on the Functioning of the European Union (00091/2011 – C7-0386/2011 – 2011/0818(NLE))". 22 May 2013. ^ "Dienstbier as minister wants scrapping of EU pact's Czech opt-out". Prague Daily Monitor. 27 January 2014. Archived from the original on 25 March 2014. Retrieved 9 February 2014. ^ "Jiří Dienstbier chce, aby Česko požádalo o zrušení výjimky v Lisabonské smlouvě". 29 January 2014. Retrieved 9 February 2014. ^ Fox, Benjamin (20 February 2014). "Czech government to give up EU Charter opt-out". Retrieved 21 February 2014. ^ "Premiér Sobotka se v Bruselu setkal s předsedou Evropské komise Barrosem i předsedou Evropského parlamentu Schulzem". Government of the Czech Republic. 20 February 2014. Retrieved 21 February 2014. ^ Bydžovská, Maria (20 February 2014). "Barroso: ČR "resetovala" vztahy s EU". Retrieved 21 February 2014. ^ "Czech prime minister in Brussels". Radio Prague. 20 February 2014. Archived from the original on 21 February 2014. Retrieved 21 February 2014. ^ "Czechs give up EU rights charter opt-out, plan joining fiscal pact". Reuters. 19 February 2014. Retrieved 21 February 2014. ^ "Press release - 3313th Council meeting" (PDF). Council of the European Union. 13 May 2014. Retrieved 17 May 2014. ^ "List of "A" items". Council of the European Union. 12 May 2014. Retrieved 17 May 2014. ^ ""I/A" item note" (PDF). Council of the European Union. 8 April 2014. Retrieved 17 May 2014. ^ "Procedure file - 2011/0817(NLE)". European Parliament. Retrieved 17 May 2014. ^ Charter, David & Elliott, Francis (13 October 2007). "Will the British ever be given a chance to vote on their future in Europe?". The Times. UK. Retrieved 13 October 2007. ^ Miller, Vaughne (19 October 2011). "UK Government opt-in decisions in the Area ofFreedom, Security and Justice" (PDF). Government of the United Kingdom. Retrieved 26 May 2014. ^ "Decision pursuant to Article 10(5) of Protocol 36 to The Treaty on the Functioning of the European Union" (PDF). Government of the United Kingdom. July 2014. Retrieved 20 November 2014. ^ "List of Union acts adopted before the entry into force of the Lisbon Treaty in the field of police cooperation and judicial cooperation in criminal matters which cease to apply to the United Kingdom as from 1 December 2014 pursuant to Article 10(4), second sentence, of Protocol (No 36) on transitional provisions". Official Journal of the European Union. C (430): 17. 1 December 2014. Retrieved 5 January 2019. ^ "List of Union acts adopted before the entry into force of the Lisbon Treaty in the field of police cooperation and judicial cooperation in criminal matters which have been amended by an act applicable to the United Kingdom adopted after the entry into force of the Lisbon Treaty and which therefore remain applicable to the United Kingdom as amended or replaced". Official Journal of the European Union. C (430): 23. 1 December 2014. Retrieved 5 January 2019. ^ "2014/858/EU: Commission Decision of 1 December 2014 on the notification by the United Kingdom of Great Britain and Northern Ireland of its wish to participate in acts of the Union in the field of police cooperation and judicial cooperation in criminal matters adopted before the entry into force of the Treaty of Lisbon and which are not part of the Schengen acquis". Official Journal of the European Union. L (345): 6. 1 December 2014. Retrieved 5 January 2019. ^ "2014/857/EU: Council Decision of 1 December 2014 concerning the notification of the United Kingdom of Great Britain and Northern Ireland of its wish to take part in some of the provisions of the Schengen acquis which are contained in acts of the Union in the field of police cooperation and judicial cooperation in criminal matters and amending Decisions 2000/365/EC and 2004/926/EC". Official Journal of the European Union. L (345): 1. 1 December 2014. Retrieved 5 January 2019. ^ Miller, Vaughne (20 March 2012). "The UK's 2014 Jurisdiction Decision in EU Police and Criminal Justice Proposals" (PDF). European Parliament Information Office in the United Kingdom. Retrieved 9 February 2013. ^ Peers, Steve (2011). EU Justice and Home Affairs Law. Oxford University Press. ^ Papagianni, Georgia (2006). Institutional and policy dynamics of EU migration law. Leiden: Nijhoff. p. 33. ISBN 9004152792. ^ Europolitics (7 November 2007). "Treaty of Lisbon – Here is what changes!" (PDF). Europolitics № 3407. Archived from the original (PDF) on 27 November 2007. Retrieved 22 November 2007. ^ Miles, Lee. The European Union and the Nordic Countries. Routledge. ^ "Denmark and the Treaty on European Union". Official Journal of the European Communities. 31 December 1992. Retrieved 27 June 2014. ^ "2011/0815(NLE) – 06/10/2011 Legislative proposal". European Parliament. 6 October 2011. Retrieved 3 March 2012. ^ "Irish Lisbon guarantees approved". The Irish Times. 18 April 2012. Retrieved 7 July 2012. ^ "Treaty on the Functioning of the European Union (Irish Protocol) – Foreign and Commonwealth Affairs". TheyWorkForYou.com. 17 May 2012. Retrieved 7 July 2012. ^ "Protocol on the concerns of the Irish people on the Treaty of Lisbon details". Council of the European Union. Retrieved 2 March 2013. ^ "MEP Gallagher welcomes EP support for Ireland's protocol to the Lisbon Treaty". noodls.com. 21 March 2012. Retrieved 7 July 2012. ^ Dale, Reginald (6 May 1997). "THINKING AHEAD/Commentary : Is Blair Leading a Continental Drift?". New York Times. Retrieved 13 October 2007. ^ Johnson, Ailish (2005). "Vol. 8 Memo Series (Page 6)" (PDF). Social Policy: State of the European Union. Archived from the original (PDF) on 27 February 2008. Retrieved 13 October 2007. ^ "Agreement on Social Policy". Eurofound. Retrieved 26 May 2014. ^ "Britain should stay in the European Union". Washington Post. 22 February 2016. Retrieved 15 March 2016. ^ "European Council meeting (18 and 19 February 2016) – Conclusions". European Council. 19 February 2016. Retrieved 15 March 2016. This page was last edited on 5 January 2019, at 20:05 (UTC).